Ordnance Survey Flying Unit Provides Map Updates for Everyone. After I spotted an Ordnance Survey post on Instagram showing Buachaille Etive Mor from the air I thought it high time to find out more about their flying unit. I had a fascinating conversation with Trevor Hilton who is the longest serving surveyor in the unit with more than 20 years experience of making maps from photographs taken from the air. Trevor explained that Ordnance Survey photograph in the region of 80,000 square kilometers of the UK every year and generally re survey the whole of the UK every three years to ensure that the database is always up to date and maps continue to be accurate. "We generally fly 400 square kilometer blocks on a task which can include site specific tasks such as new solar farms, wind turbines or new road junctions." Trevor went on to explain that one of the main advantages of using aircraft is when there is no reasonable access by other means or there are significant health and safety considerations for ground based surveyors. There are currently seven camera operators in the flying unit which is based at East Midlands Airport, all of whom are trained, experienced surveyors with Ordnance Survey. They operate on a rota basis returning to their ground based duties after a week or so at a time flying. 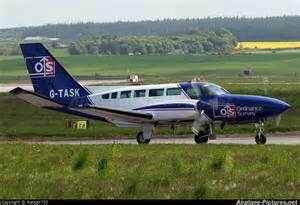 The unit operates two Cessna aircraft one 404 and one 402, each modified with two camera apertures in the floor and liveried in OS markings. Trevor told me that a good sized twin is required to accommodate the gyro stabilised large format cameras, computer equipment and the crew. Although the crew only comprises one pilot and one camera operator, the gyro stabilised mount for the camera is very heavy. Two hundredweight as described by Trevor in comforting old school style, certainly sounds heavy enough. (Just over 101kg, the weight of another well built adult male, for our younger and American readers.) The camera is no throwabout either costing as it does about £1million and delivering large format digital images of the terrain below. Challenges and Rewards of Aerial Mapping. Trevor went on to say that the pilots are not employed by Ordnance Survey but come with the aircraft which are leased from private companies that in turn change periodically with the tendering process. He has personally see three different companies provide the service in the last 20 years. "It is very demanding flying for the pilot as they must keep very level to keep the camera perpendicular, not too much rudder and no aileron"
Pilots fly a pre planned pattern with software providing them with the line to fly to capture the task. This often requires close co-operation and understanding between the crew and air traffic control services, particularly in more congested areas. Typically the more congested areas also have the most development on the ground so can be on the specific task list with greater frequency. I asked Trevor about the challenges involved in his role and he explained that the main skill was in the planning, particularly around the weather. Thousands of pounds can be wasted on bad planning or if the weather changes. As they generally fly between 8000 and 10,000 feet above ground level, clouds can easily form between the camera and the ground, obscuring the one thing they need to see clearly. Good forecasting skills, route planning and a good grip on the outstanding task list is essential. Surveyors on the flying unit all attend courses run by the Met Office but there is no substitute for experience and planning. There is always a 'Plan B' to squeeze the most from each flight. The real skill explains Trevor is being able to plan up to four hours ahead to take in transit times as well as the task itself. That is particularly true for trips to Scotland where the weather and terrain can both be challenging. Knowledge combined with experience stack the odds in favour of a positive outcome. High ground, as with tall buildings, casts deep shadow so knowledge of imaging capabilities and acceptable cut off sun angles is essential to avoid wasted pictures. Although the current cameras are all digital Trevor cut his teeth on film and plates, where wasted frames were much more expensive and difficult to retrieve. That knowledge and skill has undoubtedly proved valuable today. "The minimum sun angle is 20 degrees so that's why we don't fly in winter or too early or late in the day." 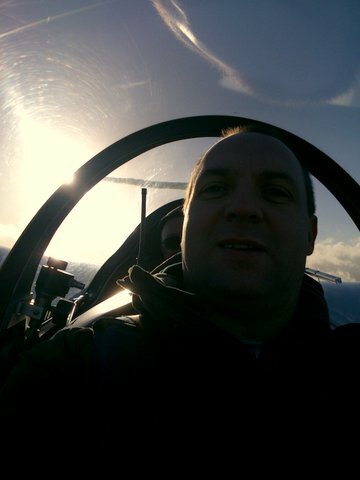 Trevor has always had an interest in photography and aviation which led him almost by chance into the flying unit as he chose to train as a surveyor. "I used to come up to Prestwick to take pictures of transatlantic aircraft as a boy with my dad and brothers as everything had to go through there at the time. They both went on to be airline pilots." The photographs are not to any scale as they are taken from different heights and angles due to sloping ground and occasional variations in aircraft attitude. Each one has to be rectified by the operator and software to transform it from being "just a pretty picture" to being a useful product that can be used to update a map. It takes about five years to build up the skills to be really good at the job. Trevor, like the other team members averages about 100-150 flying hours per year although it is impossible to predict jobs. One turn can have five or six consecutive days cramming in as many flights as possible whereas other times can be a dead loss due to weather. The 100-150,000 images per year taken by the flying unit enable very large scale maps to be made for all sorts of uses, generally around 1:1250 scale. The 1;50,000 walking maps that most people are familiar with and associate with Ordnance Survey now make up only about 6% of the business. I wondered whether the future lay in satellites and drones, technology I personally find soulless and irritating in that order, so I was very pleased with Trevor's forecast.
" We are in between satellites and drones. Tech in both areas is getting better so that's squeezing us, it may become automated but not for a long time. We need airborne platforms, tech reduces manpower levels throughout and will continue to do so. I'm happy I have a future though." I asked Trevor one of the staple questions of this site and one that is sure to continue to feature. If Ordnance Survey allowed you to take the aircraft for the day and go wherever you liked, where would it be? "Probably up to the islands, Skye and the inner Hebrides. The people who make the TV series 'Coast' asked me the same question and I told them the Cuillin Hills. Mountains are very dramatic from the air, especially rising from the sea. May and September are the best times to see them weather wise from experience." The Changing Face of Ordnance Survey. Ordnance Survey was originally a part of the British military as the name suggests. The first task was to map the Highlands of Scotland following the 1745 rebellion. William Roy, a young engineer from Lanarkshire, began in 1747 and took 8 years to map the major features, settlements, roads and waterways. William described it as "Rather a magnificent military sketch, than a very accurate map of the country." That said he did use 50 foot chains to measure distances combined with compass angles to deliver a map that was on a scale of 1:36000 which is one and three quarter inches to the mile. Leading a team of only eight people this was by any standard an incredible achievement. Continued engagements with the other half of the auld alliance, France, suggested that proper maps of the South coast were the next priority. Happily terms today are much friendlier and Ordnance Survey now operates as a government owned limited company. The last military personnel having left the outfit more than 40 years ago. Trevor described Ordnance Survey now as "a geographical information technology company at the cutting edge of digital information and data." A service with such a long history, deep roots into the soil and rock of the nation itself and sustained organic growth must surely be viewed as a national treasure? I for one am very grateful for the service they provide and the wealth of information on those sheets of paper that lead us to new pleasures and more importantly take us home again. PilotScotland.com is as much about people as it is places and machinery so I often ask people who they look up to, Trevor was happy to oblige. "Heroes you mean? As a kid, it was anyone in the space programme and Red Arrows pilots. I've just finished the book 'Miracle on the Hudson' and Sully is one of them. (1) Anyone who makes difficult things look easy. there are thousands of people out there every day, unsung heroes, air traffic controllers for example. People never think of them when they go on holiday but they make things safe for all of us." By That definition Trevor I would say you and your colleagues rank right alongside them. Thank you. (1). On 15th January 2009 Captain Chesley "Sully" Sullenberger force landed his Airbus A320 in the Hudson River after colliding with a flock of geese shortly after take off. Several birds were ingested into the engines causing catastrophic failure and total loss of power. Captain Sullenberger and his co-pilot Jeffery Skiles maintained control and landed on the water with such skill that all 155 persons aboard survived and were rescued. The US National Transportation Safety Board described the event as "the most successful ditching in aviation history." Interview and text by Jim Walker 3rd March 2017. Thanks to Trevor Hilton and Ordnance Survey press office. Additional resources from National Library of Scotland, ordnancesurvey.co.uk and Wikipedia.